From conception to occupancy, learn what it takes to rebuild your home and be your own contractor. The one-day, 7-hour seminar will cover everything from developing your home plan to occupancy. It is recommended for those who are ready to move from the disaster of losing their home to the reality of being home again. Join us for the best day you will invest in before making the decision to rebuild as your own contractor or not. 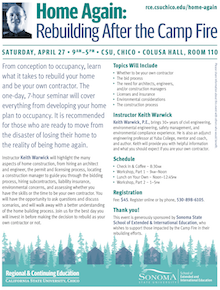 The event will take place April 27, 8:30AM–5:00PM at CSU, Chico. Registration is $45. For more information and to register, visit https://rce.csuchico.edu/home-again. Sponsored by CSU, Chico Regional & Continuing Education and Sonoma State School of Extended & International Education who wishes to support those impacted by the Camp Fire in their rebuilding efforts.